Incoming blockade-run use from Nassau to Milledgeville Ga. via Wilmington. Pristine cover addressed to Gov. Joseph E. Brown in Milledgeville Ga., manuscript "Ship Letter" endorsement but no postal markings, indicating hand-carriage from port of Wilmington, receipt docketing "Receipt for freight on Steamer Charlotte, Nov. 1864", with original enclosure (few small tape stains) datelined "Nassau N.P. 2 Dec. 1864" from J. C. Bailie, who worked for Adderley & Co. in Nassau, reporting on shipment of goods on steamer Charlotte. Carried on blockade-runner Blenheim, departed Nassau Dec. 2, 1864, arrived Wilmington Dec. 6. The Blenheim was active Oct. 1864 to Jan. 1865, 4 for 5 in successful trips; captured by the U.S.S. Tristram Shandy at Wilmington on Jan. 25, 1865. Ex Walske. $2,000. 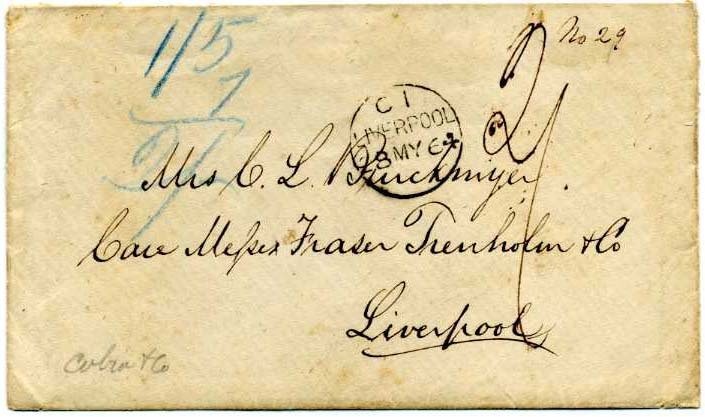 Outbound blockade-run cover: Summerville S.C. to Liverpool via Wilmington and Nassau addressed to Mrs. C. L. Burckmyer, Care of Messrs Fraser Trenholm & Co., Liverpool, England, entered British Mails with "Bahamas AP 16, 1864" circular backstamp, unpaid with 2sh due, comprising 1sh packet postage to England and 1sh penalty fee, blue crayon "1/5 + 7 = 2/" accounting (1p plus half of penalty retained by Bahamas P.O. 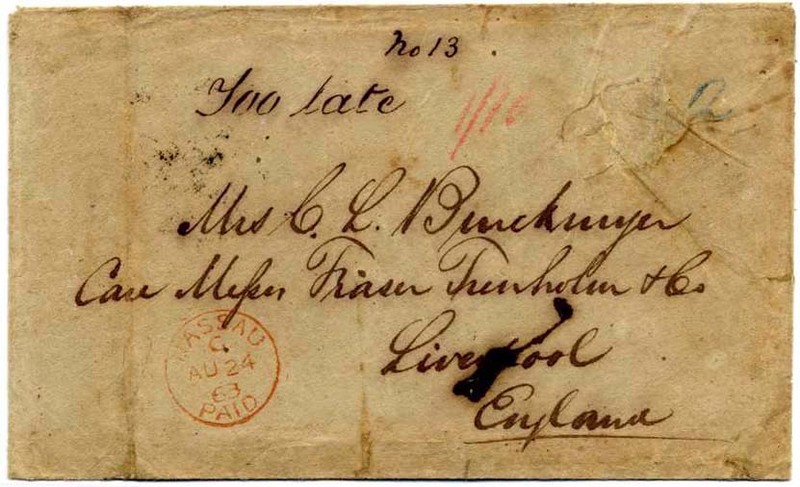 ), Liverpool receiving datestamp (May 28, 1864), minor edge wear and back flap tears, still Very Fine, ex Myers, with 2004 PF Certificate #0418680. The famous Burckmyer correspondence extensively written up in The Confederate Philatelist. Ex Felton. $2,500. 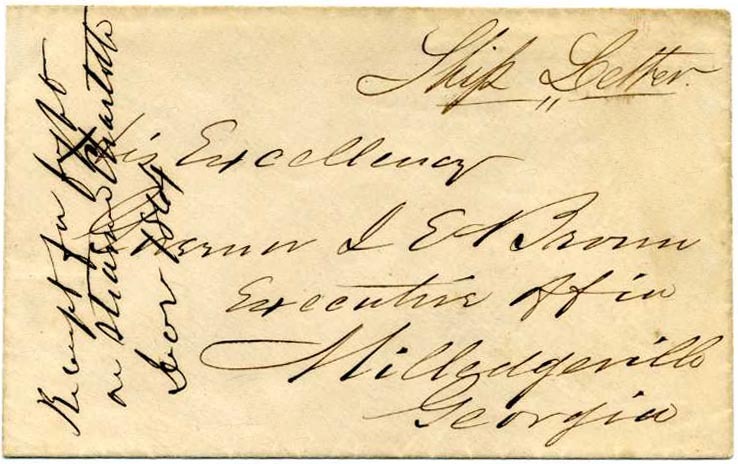 Incoming blockade-run use on folded letter re tobacco business from John K. Gilbert, London, England dated Aug 25, 1864 to William Gray, Esq, Richmond, Va.; postmarked with oval STEAM-SHIP,CHARLESTON / S.C. // OCT / 10 cds and manuscript "12" rate, Very Fine and scarce. Ex John Hill. $2,000. Outgoing blockade-run use: Charleston S.C. to New York via Havana, Cuba and Nassau, Bahamas. Narrow cover to Mrs. Sarah J. Davega (? ), No. 419 Fourth Str, New York, United States. 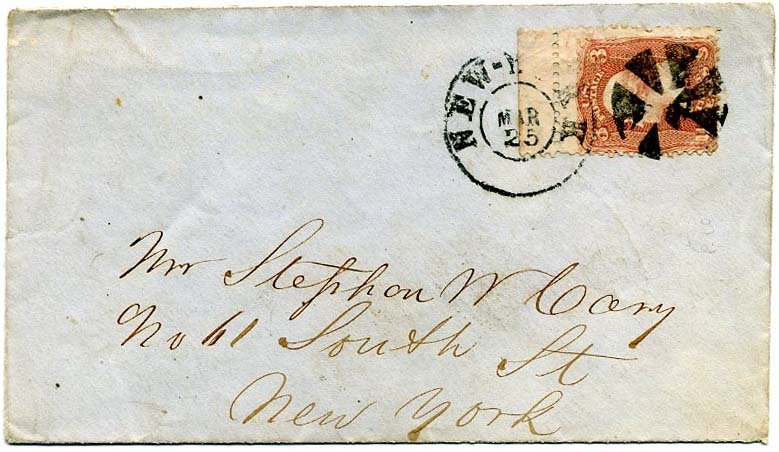 Entered Bahamas mails with red "Nassau Paid NO 7 61" circular datestamp, crayon "4" pence rate, manuscript "(2)" (meaning unknown), New York "5" in circle due handstamp, absolutely fascinating 3-page original letter enclosed which admonishes all Southerners residing in the United States to return to the South immediately or risk having their property taken in sequestration. “…all Southerners residing in the United States should have commenced their journey homewards since the 30th August last unless able to prove that either sickness or something of an extraordinary nature prevented them from so doing and in that event they should use every possible effort to get home or out of the present United States as soon as they can…such persons who may go to Canada & should let their friends in Charleston known can do so by writing to Havana and enclosing a letter for Charleston which letter can be sent from Havana by frequent opportunities…Friday Night Oct 11 1861…Having just learnt that a gentleman is going to Havana tonight in a small schooner in haste I have written this to let you know how things stand.” Signed Jacob Ottolenghi. He mentioned any number of people who “should leave and come into the Southern Confederacy or go to Canada.” Cover with edge repairs at sides, Very Fine appearance, with 1984 P.F. certificate states “Stampless cover from Charleston SC Oct 11 1861 via Havana and Nassau Nov 1 to New York”. It is listed in Special Mail Routes of the American Civil War by Steven Walske and Scott Trepel as BO-Nas-1. 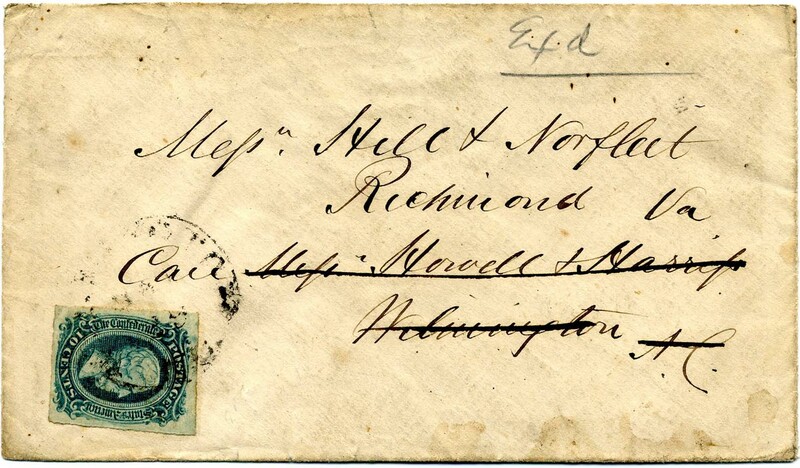 The year date in the Nassau postmark appears to be 1864. Either it is wrong or the correspondence is mixed as it does appear in the same hand and ink. $3,000. 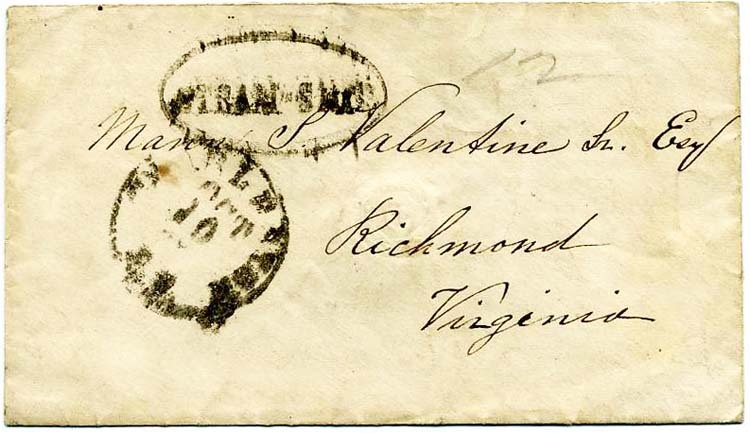 Incoming Blockade-run cover canceled CHARLESTON / S.C. // OCT /10 with matching oval STEAM-SHIP handstamp and pencil “12” on cover to Mann S. Valentine Jr. Esq., Richmond, Virginia. Ex Morris Everett. $1,900. Outgoing blockade cover [Portland, Maine Exchange Office] and January 1, 1863, LETTER from Mott-Bostick correspondence; letter dated from Greenville, SC and sent by blockade runner from Charleston (as mentioned in text) directly to a forwarding agent or correspondent where cover entered British mails with stamp (now cut out) and Liverpool February 26, 1863 postmark; entered U.S. mails with Portland, Me Am Pkt Paid 24 exchange datestamp. The 24¢ rate included delivery to Hamilton, NY. The blockade-runner Leopard departed Charleston on January 14, 1863 to Nassau and likely carried this letter. Cover noted “No. 10” up right side. The Mott-Bostick correspondence is well-known to serious students. 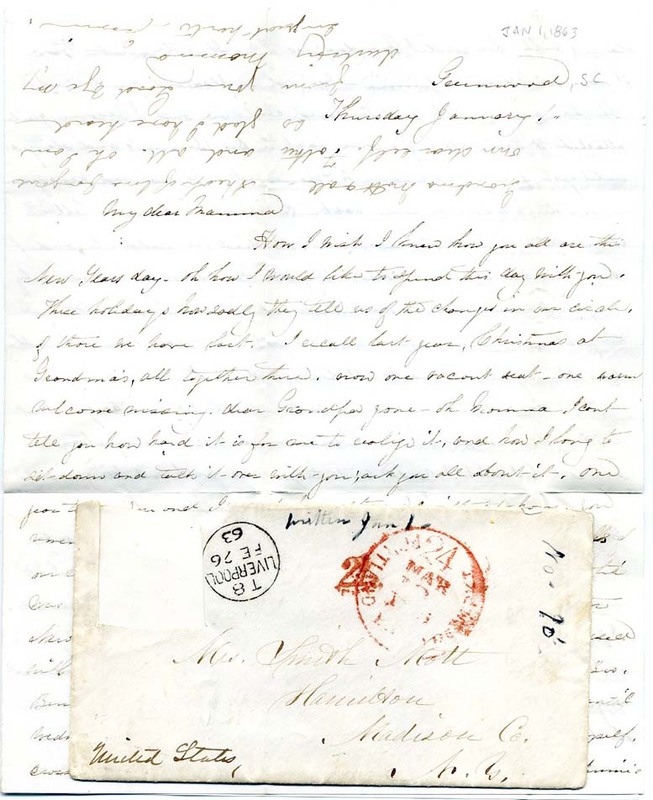 This letter is from Maria Bostick, wife of a Confederate soldier, and her mother, Mrs. Smith Mott in Hamilton, NY. This 4-page letter says, in part, “Hannah Ford’s husband…has frequent opportunities of sending letters by steamers running the blockade. He offers to let me know and use the privilege of sending letters…” Most letters from this correspondence went by Flag of Truce across the lines. This and one other are known to have been run through the Federal blockade at Charleston to England with a possible routing via Nassau, Bahamas. This correspondence is the subject of the Jan-Feb 1974 Confederate Philatelist in Dr. Edward Greenwald’s article “Civilian Flag of Truce Mail - The Mott-Bostick Correspondence” which describes the correspondence as well as explanatory flag of truce tables. $400. Incoming Blockade cover from France, clear strike red forwarding agent's oval "G.A. Hopley, Charleston, SO. CA." 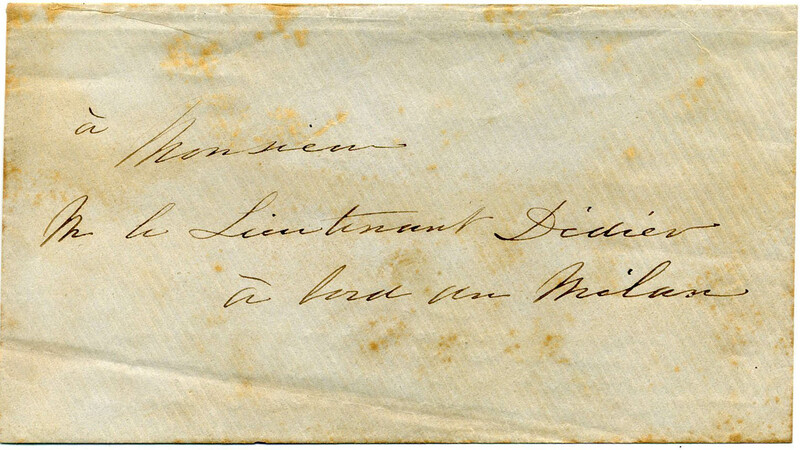 – rare incoming marking – on small clean narrow envelope addressed to "Monsieur Petigru à Charleston" to which has been added "S / C" in another hand; docketed "Rec'd 6 July 1861." Owing to the date, it is an early blockade cover from France. The blockade was announced on April 27, 1861. 2000 PSE Certificate. Hopley & Co. of Charleston were factor and commission merchants (shippers) located at the Atlantic Wharf per Charleston City Directory of the time. George A. Hopley was also Charleston’s British Consul. Unusual without incoming ship marking. Apparently, the Hopley handstamp serves for this. Ex Walske. $2,000. 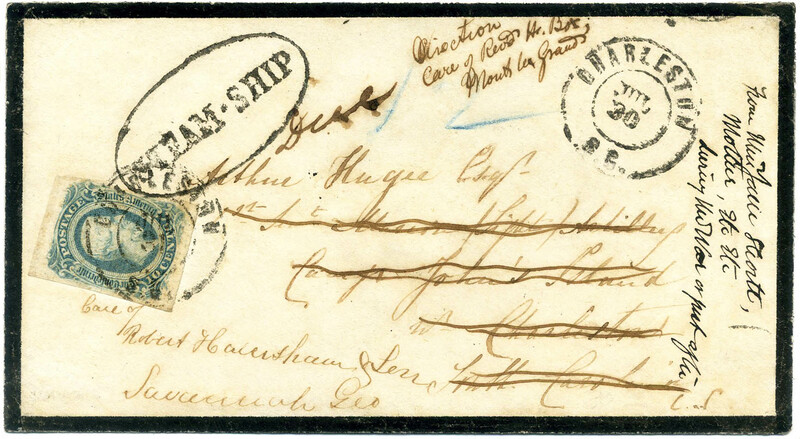 Outgoing Blockade: 1861 [May 21] Charleston S.C. to Longport, Staffordshire England cover with original letter (file fold splits reinforced with archival tape) saying "This will introduce, Thos. M. Horsey Esq…[who]visits England to endeavor to make arrangements for a supply of good…under the new tariff of the Confederate States. [signed’ Geo. S. Cameron." Cameron was a banker. This letter was hand-carried, most likely on Bremen Bark Gause departing Charleston May 24th to Amsterdam, likely not stopped because she was flying a foreign flag and left within the 15-day grace period for foreign ships to clear blockaded ports, Very Fine. SCARCE USE DURING THE "PAPER BLOCKADE" PERIOD. A week after Fort Sumter was fired upon President Lincoln proclaimed a blockade of southern ports. This was a "Paper Blockade" as the U.S. Navy had few assets to enforce it. The first U.S. ship did not arrive off Charleston until May 11, and it could not cover the four harbor entrances. Over time, their numbers increased and passage became more difficult. $600. Outgoing Blockade: 1863 Charleston S.C. to New York N.Y. via Nassau, cover from the Wells correspondence to New York, carried by Fannie from Wilmington to Nassau, clear strike of red "NASSAU PAID A JA 6 64" cds and red crayon "4" rating for British packet service to Thomas L. Wells, Esq, 94 West Eleventh St, New York, bold black encircled [due] 5 handstamp; professionally restored to Very Fine appearance. The letter that was contained in this envelope, which no longer accompanies, was from Private Edward L. Wells, a private in the Charleston Light Dragoons, Co. J., 4th S.C. Cavalry (he published a history of the unit in the 1880s). Walske No. BO-Nas-55 / CSA Catalog BOB-01 with CV $2,500. Ex Karrer. $850. 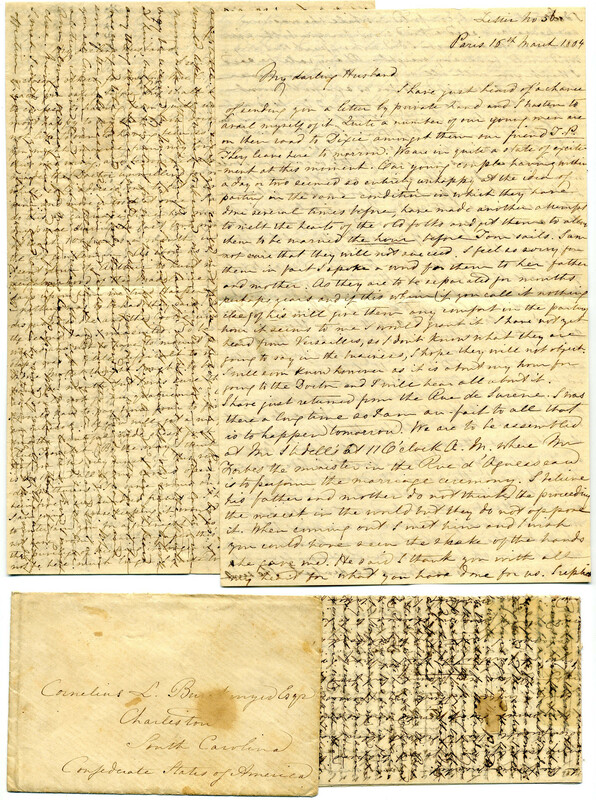 Outgoing Blockade from Charleston S.C. to Stephen W. Cary. No 61 South St, New York, pristine blue adversity cover made from a printed Confederate court document CONCERNING PRIZE COURT AND LETTERS OF MARQUE AND PRIZE GOODS, this was likely carried on an outbound blockade runner and given to an agent bound for New York at Bermuda or Nassau, entered mails bearing a top sheet margin US 65, 3¢ rose, tied by NEW-YORK / MAR / 25 [probably 1864] dcds duplexed with circle of wedges, Very Fine. 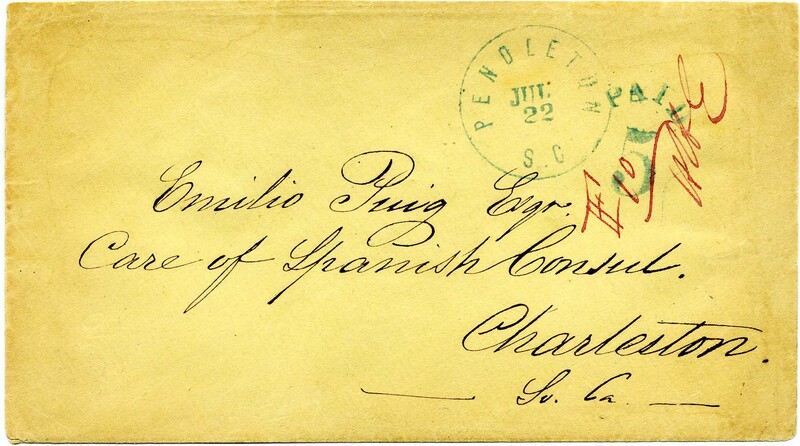 Known correspondence originating in Charleston S.C. Local free home mail delivery began in 1863. The U.S. did not recognize the Confederacy and a formal state of war and thereby created a contentious situation where privateers with letters of marque were not recognized and those men captured treated as pirates subject to immediate execution. Ex Atlanta Collection (Kaufmann Auctions) $1,500. Incoming Blockade Letter from Edinburgh, Scotland to Charleston S.C., (no cover) apparently sent privately via the Bahamas, with original note from local forwarder E.G. 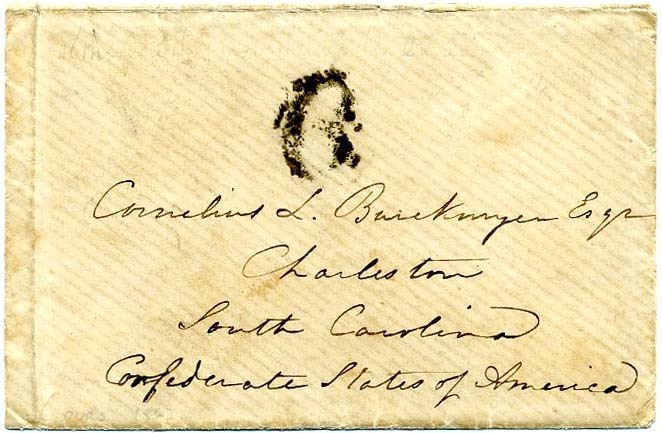 Douglas who arranged to send the letter out of the mails via unknown blockade runner into Charleston. The letter is on printed letterhead “Cannonmills House, Edinburgh” dated July 22, 1864. 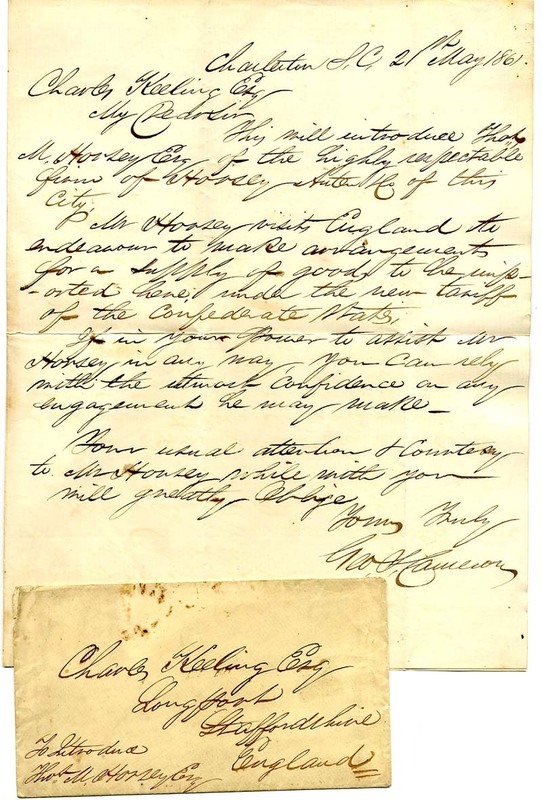 The note reads "A Friend of yours in London has enclosed this letter to me requesting me to forward it to you by what I consider a likely route. So I take the liberty of putting in this scrap requesting you if it should reach you, to inform my sister Mrs. John Mackenzie that her friends are well and have written to her frequently. Mr. Muir who left here for Charleston a few weeks ago was kind enough to call to see us and got a message for her. Hoping this will reach you, I am E. G. Douglas." Letter reads, in part, “I am sick at heart with the details of the war. Why they speak as if a few thousand lives were of little moment and take little of the anxious hearts everywhere…” $450. 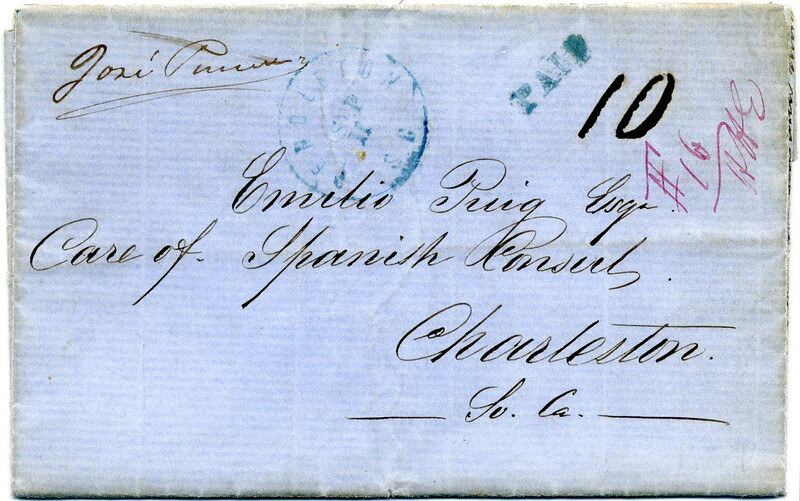 Outgoing blockade cover from Savannah Ga. to Rome [(Italy] via Charleston and Nassau. 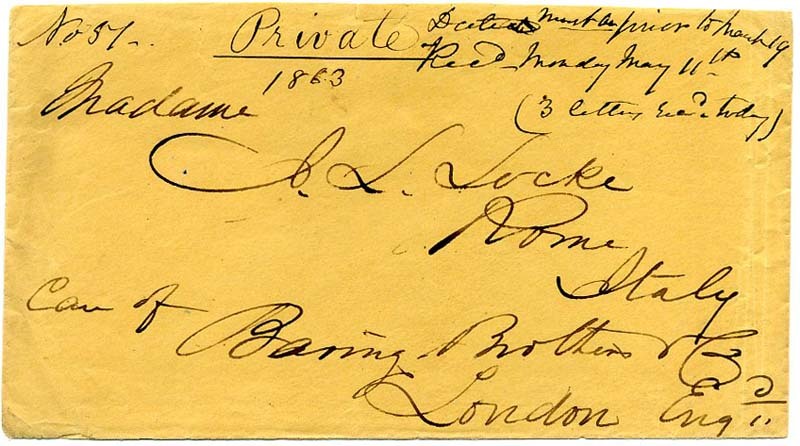 Nov. 3, 1862 origin date on cover to Mrs. John Lorenzo Locke in Rome, in care of Baring Brothers (bankers) in London, "FORWARDED BY SAWYER & MENENDEZ, NASSAU N.P." forwarder's blue oval handstamp on back, Sawyer & Menendez note "Answered this and sent to Baring. Menendez" on back, sent under cover to England, entered mails with "Lombard Street Paid JA 13 62" circular datestamp, red "1/" rate (11p to Italy plus 1p late fee), red "PD" oval, Calais (Jan. 14) transit datestamp, receiving backstamp, small edge tears and internal fold reinforced with archival tape. Ex Walske. Exploded to display all colorful markings. $2,900. 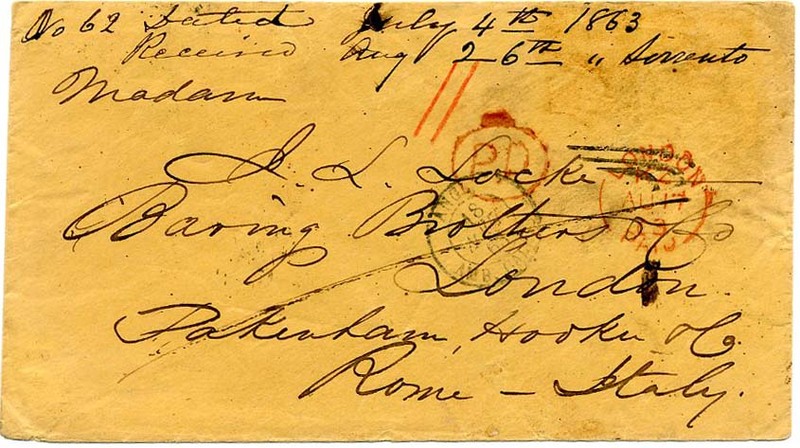 Outgoing blockade cover from Savannah Ga. to Rome, Italy on pristine cover to Madame John Lorenzo Locke care of Baring Brothers (bankers) London, England. It is marked (letter) No. 57 in the correspondence dated by docketing March 19, 1863 and received in Rome May 11, 1863. There are no postal markings as it did not entered the mails. Docketing indicates three letters were received together. It was carried privately by blockade runner to London where it was put into the hands of forwarding agent for delivery to Rome. Had the blockade runner been captured, the letter would have been confiscated and landed in Prize Court. Top back flap missing and tiniest edge faults. Well-known correspondence. $1,400. Incoming blockade: [Charleston SC] “6” due handstamp, bold strike on small commercially made laid paper cover to “Cornelius L. Burckmyer Esq, Charleston, South Carolina, Confederate States of America” – originally contained Burckmyer letter #22 (no longer present) dated in France 16 Sept 1863 from modern notations on verso. $2,000. The Burckmyer correspondence was first offered as an original find through Kaufmann Auctions and heavily written up in The Confederate Philatelist. 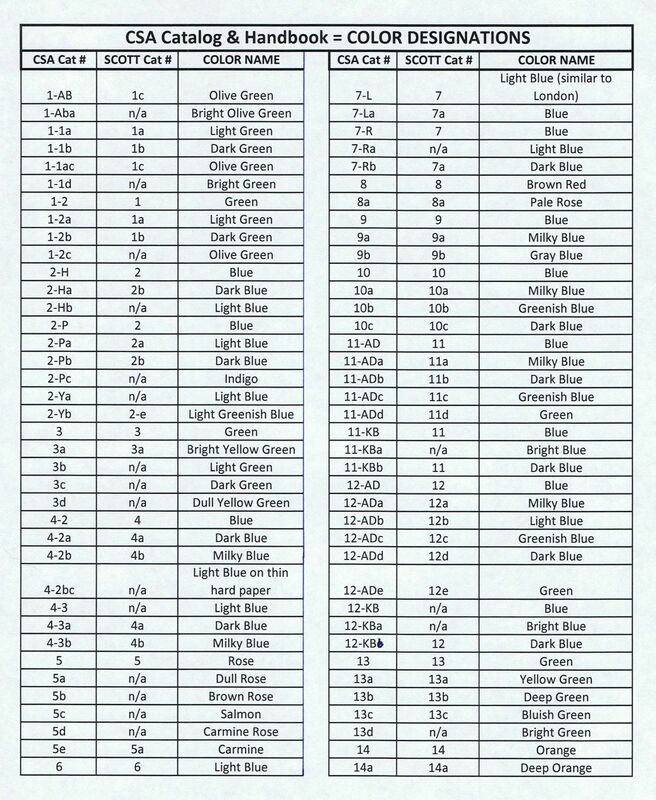 It is a correspondence between two exceptionally well educated, literature and descriptive people who write much about the nature of corresponding by flag of truce in perfectly readable hand, thus a boon to postal historians. The Burckmyers lived in France when war broke out and Cornelius returned to Charleston while Charlotte (nee Boyce) and daughter Mamie (nicknamed Cooty) remained in France. Outgoing blockade, Charleston to New York via Nassau. 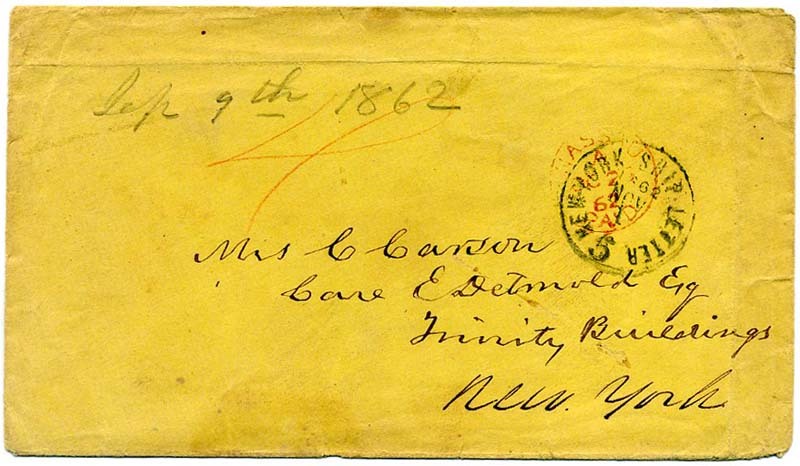 Pencil receipt docketing "Sep. 9th, 1862" (origin date at Charleston) on yellow cover to “Mrs. C[aroline] Carson, Care of E. Detmold, Trinity Buildings, New York.” Entered British Mails with red NASSAU/ PAID / OC / 23 / 62 cds, red crayon "4" pence rate paid in cash, NEW-YORK SHIP LETTER / 5 / 1862 / NOV/ 1 integral-rate cds; note on back "Most happy to have the opportunity of forwarding you a letter fresh from the hands of Your Excellent father -- C.E.D. Nov. 1 / 62" (C. E. Detmold), couple content folds at top and right. Featured in an article by Morris Everett in The Confederate Philatelist, July-August 1989 as well as an article by J.V. Nielsen, Jr. in The American Philatelist, August 1967 – a well-known correspondence. Copies of both articles included. Carried on blockade-runner Scotia, departed Charleston Sep. 26, 1862, arrived Nassau Sep. 30; missed the Sep. 29 sailing to New York and the forwarder held it until Oct. 23; then Cunarder British Queen, departed Nassau Oct. 27, arrived New York on November 1. Ex Nielsen, Everett and Walske. $1,900. Jane Caroline Petigru Carson (1820-1885) detailed bio on linked page. Outgoing Blockade-Run Cover to England Via Nassau,1863 cover from Charleston to Liverpool from the well-known Burckmyer correspondence ("No. 13"); manuscript "Too Late" & red Nassau / Au 24/ '63 / Paid cds at bottom left and red crayon "1/10" due marking, backstamped with Liverpool arrival marking, Walske / Trepel book states, "two 6d Bahamas stamps removed", despite a repair in the area of where stamps might have been placed, it is difficult to see any evidence of stamps replaced, some aging and usual wear; blockade cover with the rare "Too Late" endorsement. $525. Incoming blockade: CSA 12-AD, 10¢ blue tied by bold CHARLESTON / S.C. // JUL / 30  double-circle datestamp and "STEAM-SHIP" oval handstamp on INCOMING BLOCKADE-RUN BLACK-BORDERED MOURNING COVER to Arthur Huger, Esq., 1st Lieut. Marion Light Artillery, Camp John's Island, Charleston, South Carolina, "Due" and blue manuscript "12" rate including 2¢ ship fee. CSA 12 pays for FORWARDING TO ROBERT HABERSHAM & SON, SAVANNAH GA., Savannah forwarder docketing on back, cleaned and some minor cosmetic improvements. Docketing up right side shows sender was Sallie Scott. Extremely fine appearance. An outstanding incoming blockade-run cover with great provenance of Ex Emerson, Antrim, Haas, Shenfield, Hill, and Walske. $5,750. Outgoing blockade-run use from Charleston to Paris via Nassau carried by blockade runner Leopard on Jan. 14, 1863, arrived Nassau Jan. 19 where struck with blue "Forwarded by Henry Adderley & Co., Nassau N.P. 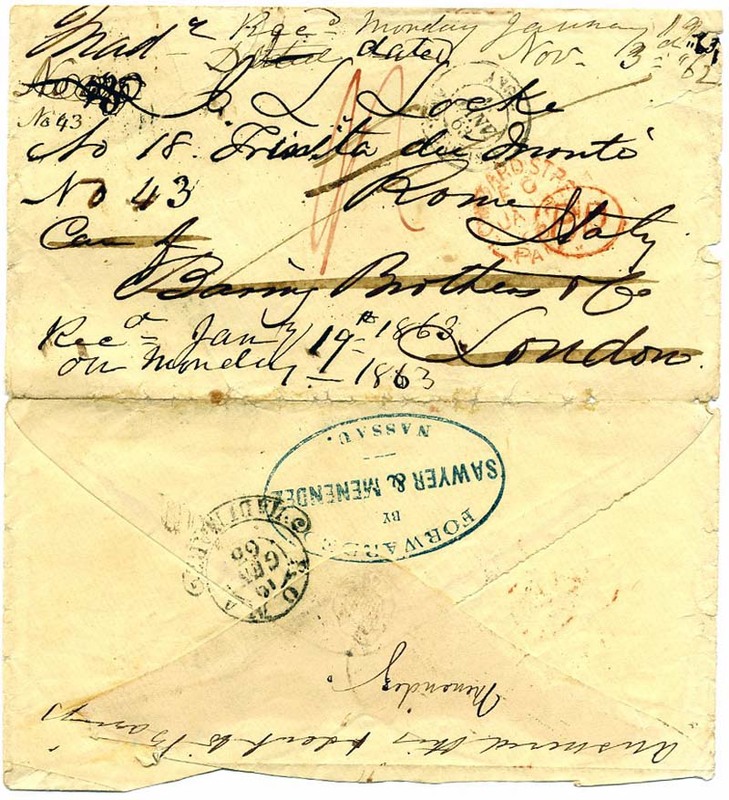 Bahamas" handstamp at bottom left, red Nassau Paid JA 19, 1863 cds, red oval PD handstamp and manuscript 1/3 rate, carried on Cunarder British Queen on Jan. 21 to New York, then by Cunarder China on Jan. 28 to Queenstown, London transits, Paris Feb. 14 receiving datestamp, expertly cleaned and repaired, Very Fine appearance, Fraser Trenholm & Co. used Henry Adderley & Co. as their Nassau agent, ex Antrim and Walske, with 2002 CSA certificate. $2,200. Incoming blockade-run use from London to Richmond via Nassau. Folded letter datelined London Dec. 9, 1863 (copy) from John Gilliat & Co. regarding tobacco but closes with some good war content regarding Bragg and Meade, as well. 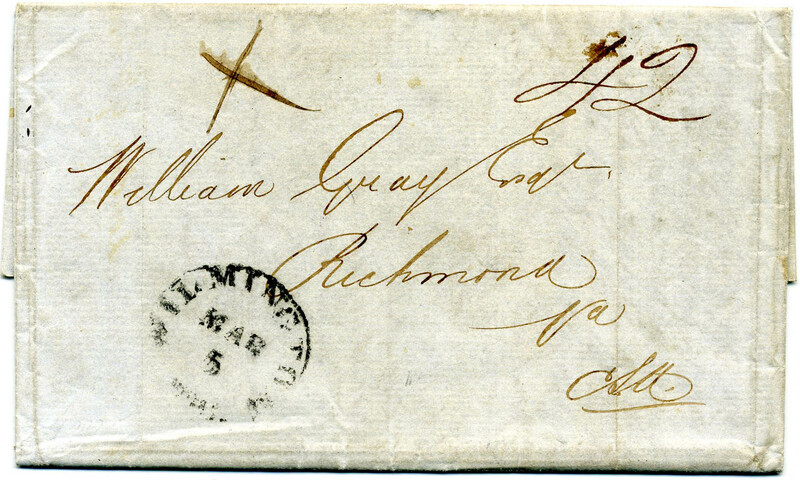 Addressed to William Gray, Esq., Richmond Va., carried by Cunarder China from Liverpool on Jan. 30, 1864, arriving New York Feb. 11, then by Cunard branch line to Nassau where placed aboard the blockade runner Annie on Mar. 1, arriving Wilmington Mar. 4, manuscript X examined mark by provost marshal at Wilmington, Wilmington / N.C. // Mar / 5  cds and manuscript "42" rate for QUADRUPLE THE 10¢ RATE to Richmond plus 2¢ ship fee, Very Fine. SCARCE CENSORED INCOMING BLOCKADE-RUN COVER WITH A HIGH RATE FOR WEIGHT, with 1981 CSA certificate, Ex Walske. $3,000. Outgoing blockade-run use from Petersburg Va. to London via Wilmington N.C., Nassau, Havana and St. Thomas. 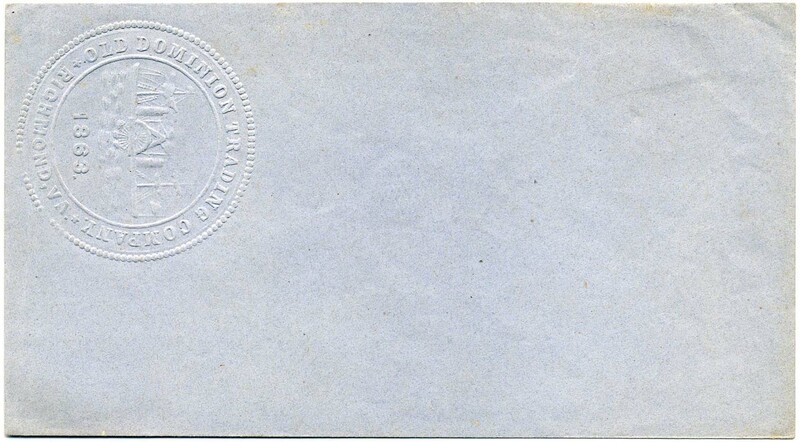 Pristine outer folded letter, with dateline only (no contents), at Petersburg, Va., on May 23, 1864, addressed to London, endorsed "Care of Geo. Chambers & Co. NP" (New Providence) and Edith, carried on that blockade runner from Wilmington on May 26, arriving Nassau May 30, posted unpaid by Chambers & Co. with blue crayon rate "1/5 (+) 7--2/-" for two shillings due, clear strike NASSAU-NEW-PROVIDENCE/ JU 7 / 1864 cds on back, delayed by forwarder and missed the monthly sailing of the Cunarder to New York; routed instead on the Corsica to Havana and St. Thomas, then by the RMSP steamer Tasmanian, departing St. Thomas Jun. 29 and arriving Southampton Jul. 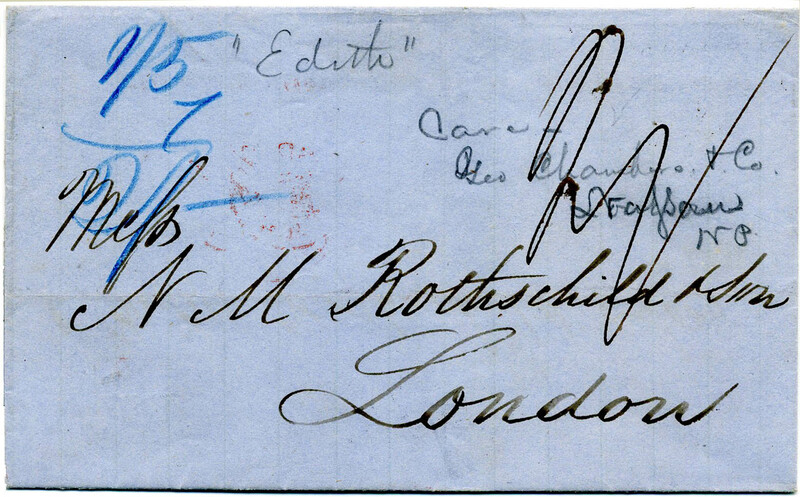 13, red London receiving backstamp of Jul. 14. Very Fine, UNUSUAL ROUTING. The Edith was armed and renamed the CSS Chickamauga in August 1864; she made one cruise and never went to sea again, she was scuttled in January 1865, ex Ludington and Walske. $2,750. 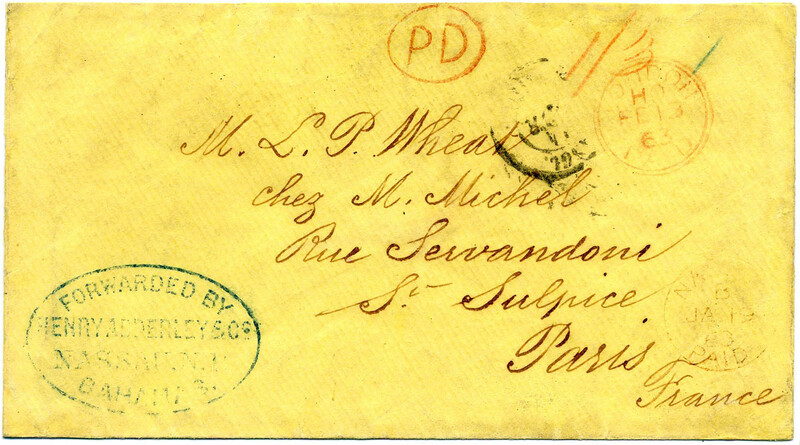 Incoming blockade-run use from Paris to Charleston via Bermuda and Wilmington N.C. Small cover with THREE ORIGINAL LETTERS datelined at Paris, France, in February-March 1864, addressed to Captain Burckmyer at Charleston, nos. 34-36 with the usual cross-written content on thin paper (some reinforced file splits), excellent articulate content with details about Confederate soldiers they know, wedding at Confederate Embassy in Paris, etc. 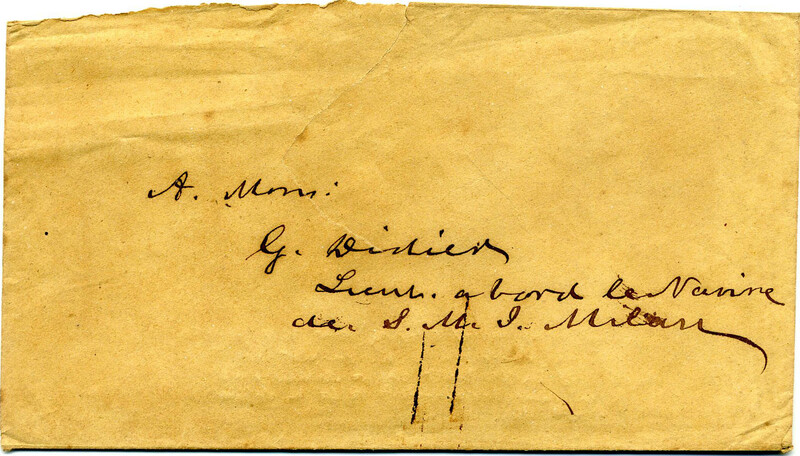 Carried privately from France so no postal markings, transited Bermuda and then to Wilmington, N.C., and Charleston, S.C.; Burckmyer correspondence is well known. Ex Walske. $500. The Burckmyer blockade correspondence was first offered as an original find through Kaufmann Auctions in 1981 and heavily written up in the Confederate Philatelist. Much more information on linked page. Incoming blockade-run use from Charleston to New York via French Man-of-War. Cover endorsed to Lt. Didier of the French man-of-war Milan, from New York to Charleston, containing a letter between Charleston Unionist James Louis Pettigru and his daughter Caroline, handcarried by Lt. Didier. On occasion, a foreign ship was allowed through the blockade. Letter no longer accompanies but the letters are published, in Life, Letters and Speeches of James Louis Pettigru. Minor toned spots, the Milan came through the blockade to Charleston in December 1862 to deliver the French consul and left in mid-January 1863 for New York, a report from the USS Powhatan off Charleston discusses the entry of the Milan. Ex Walske with his description on verso. $325. Outgoing blockade-run use from New York to Charleston via French Man-of-War. Cover endorsed to [Lt.] G. Didier of the French man-of-war Milan, from New York to Charleston, containing a letter between Charleston Unionist James Louis Pettigru and his daughter Caroline, handcarried by Lt. Didier. On occasion, a foreign ship was allowed through the blockade. Letter no longer accompanies but the letters are published, in Life, Letters and Speeches of James Louis Pettigru. This one contained excellent content (page 463) including "in a civil war no man's honor can be reproached for refusing to draw his sword," also, "As to your mama...She is a good deal scandalized by your partiality to the North; so different from her feelings which are thoroughly Southern." Part of back flap missing and large sealed tear on face. The Milan came through the blockade to Charleston in December 1862 to deliver the French consul and left in mid-January 1863 for New York, a report from the USS Powhatan off Charleston discusses the entry of the Milan. Ex Walske with his description on verso. $200. 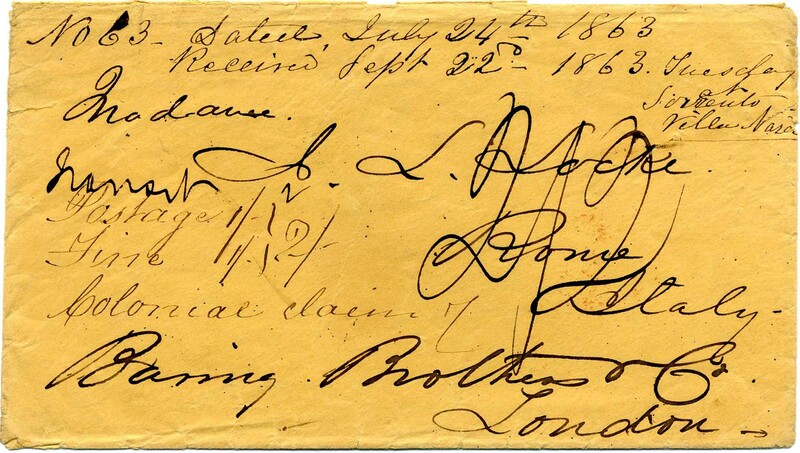 See April 2018 American Philatelist - Civil War Prize Court Mail: Profits and Bounty on the High Seas Led to Philatelic Treasures. 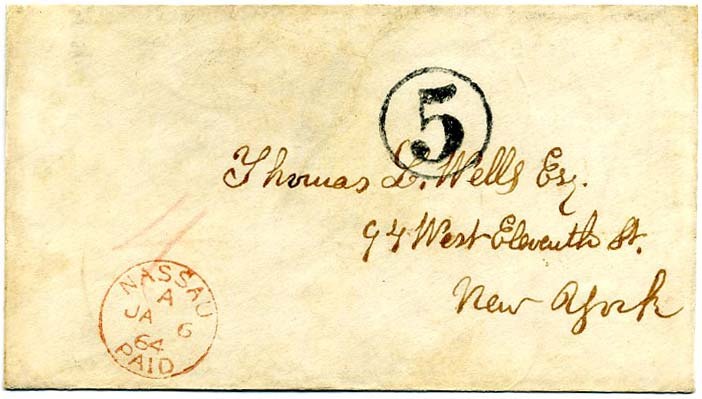 Outgoing Blockade Cover to New York, originating in Charleston, S.C. where "5" in circle rate handstamp was applied & sent through the Bahamas with "Bahamas JY 3, 1864" backstamp, signed under flap, "Approved by order, H.W. Feilden", a piece of the cover is missing at the upper right (repaired) where a stamp was removed, otherwise Fine, with 2004 CSA certificate #04495. RARE. $850. CSA 11, 10¢ blue (4 margins) tied lightly struck WILMINGTON / N.C. // MAY / 29 /  cds on cover to Hill & Norfleet (commission and forwarding merchants), Richmond, Va., in care of Howell & Harris in Wilmington N.C., (crossed out); with pencil "Exd" Provost Marshal censor marking applied at Wilmington, part of back flap removed, light soiling, Very Fine. RARE INBOUND BLOCKADE-RUN COVER FROM BERMUDA. Carried on blockade-runner Lynx, dep. St. Georges May 24, 1864, arr. Wilmington May 28. The Lynx was owned by Fraser Trenholm & Co.; active May 1864 to Sep. 1864, 9 for 10 in successful trips. This cover was hand-carried or carried in another packet from Bermuda. On arrival, the letter was examined by the provost marshal and marked "Exd". Howell & Harris stamped it and mailed it May 29, 1864. Ex Walske. With 2010 PF certificate. $3,500. 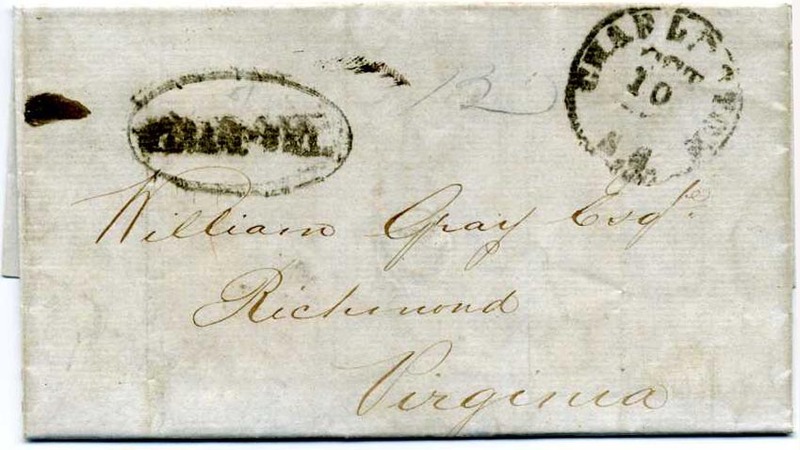 OUTGOING BLOCKADE-RUN COVER from Wilmington N.C. to Henry Watson, Esq., Heidelberg, Germany. 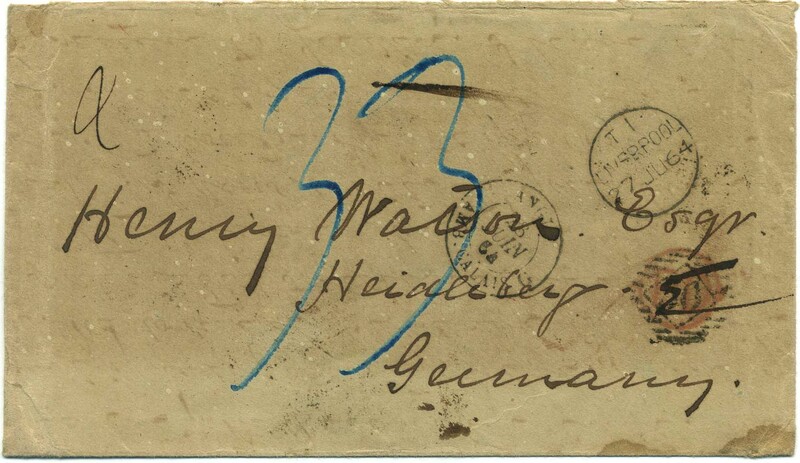 carried under cover via Nassau to Liverpool forwarder (probably Fraser Trenholm), then by mail to Heidelberg, transit datestamps applied at Liverpool (June 27, 1864), London (June 28), Calais (June 28), Paris (June 29), Strasbourg (June 29) and Heidelberg (June 30), blue manuscript "33" rate, red rate marking overstruck by numeral grid, some slight toning, Very Fine. $1,300. OUTGOING BLOCKADE-RUN cover from Savannah Ga. to Rome, Italy, via Nassau, Bahamas from the well-known Locke correspondence, originating in Savannah on July 24, 1863 (docketed), addressed to Mrs. J[ohn] L[orenzo Locke, Rome, Italy, care of Baring Bros. in London, carried from Charleston on the blockade-runner Margaret & Jessie, departing August 1, 1863, arriving Nassau Aug. 4, held by forwarder until next sailing for New York, backstamped "Bahamas AU 22 1863 B", carried from Nassau to New York, then by Cunarder China (Aug. 26) to Queenstown (Sep. 4), manuscript "Postage 1/-" plus "Fine 1/- Colonial claim", total "2/2" due, docketing across top indicating Sorrento as final destination, small edge wrinkles and tears, Very Fine, Walske census No. BO-Nas-36. Ex Walske with his notes on verso. $1,800. Outgoing blockade: Savannah, Ga., to Rome, Italy. 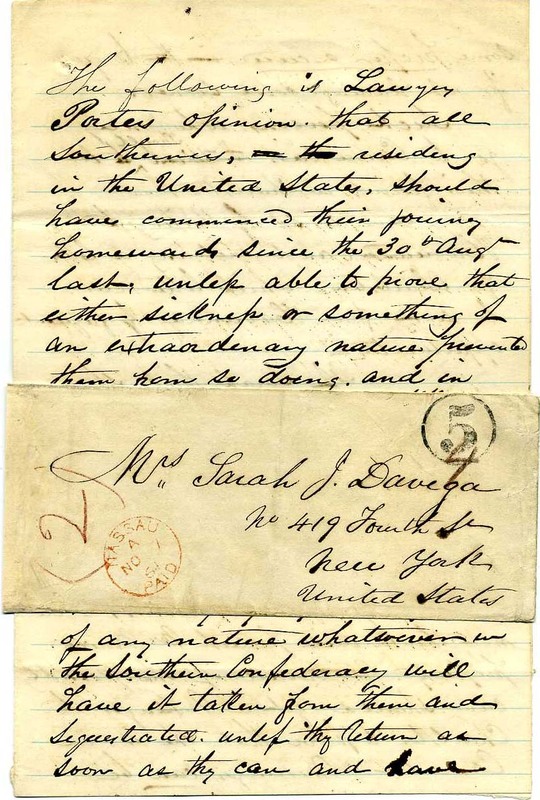 Locke correspondence originating in Savannah, as noted by contemporary docketing at top referring to the letter (no longer with cover), “No 62 Dated July 4th 1863 – Aug 26th 1863 Sorrento.” The envelope was under separate cover from Savannah via Charleston to Nassau and on to Barring Brothers in England. Barring Brothers removed the outer cover and entered the subject envelope into the British mails via France to Rome. Colorful transit markings front and back. Top back flap has sealed opening tear. Outbound blockade covers only make up about 30% of all blockade uses. 2007 CSA certificate. $3,500. 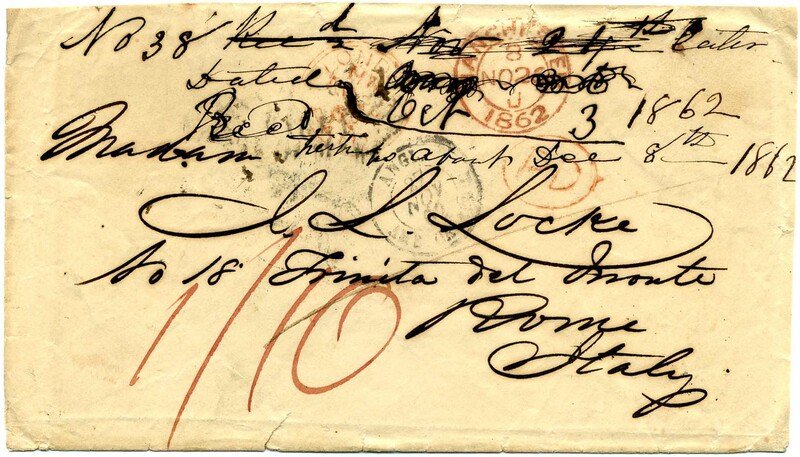 OUTGOING BLOCKADE cover from the well-known Locke correspondence from Savannah, Georgia, to Rome, Italy. The cover originated in Savannah as noted by contemporary docketing at the top referring to the original letter “No. 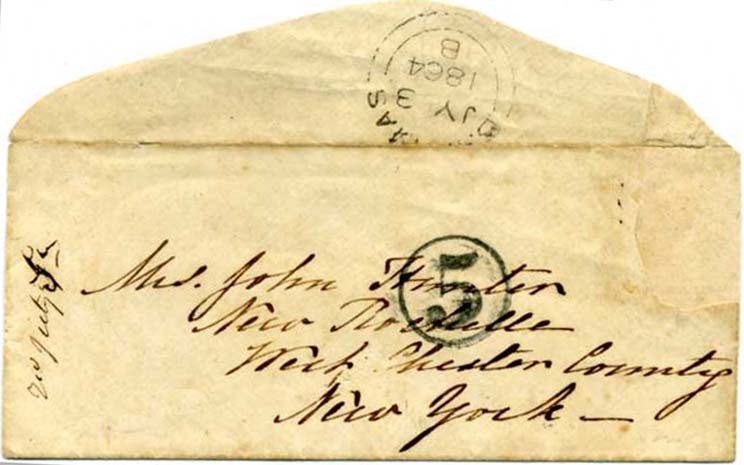 38, Recd Nov 24th letter dated Oct 26th Oct 3 1862 Rec’d T….t…s about Dec 8th 1862” (lots of correction/crossing out). The envelope was sent under separate cover from Savannah via Charleston to Nassau and on to Barring Brothers in England. Barring Brothers removed the outer cover and entered the subject envelope into the British mails via France to Rome. Small opening edge and flap tears that are more than made up for by the wonderful colorful transit markings front and back. Outbound blockade covers only make up about 30% of all blockade uses, 2007 CSA certificate. $2,200.